Troubleshooting Name Resolution Issues on DirectAccess Clients | Richard M. Hicks Consulting, Inc.
IPv6 is always used between the DirectAccess client and server, regardless of network configuration. What changes when DirectAccess is behind a NAT is the IPv6 transition protocol. For edge deployments, the client can choose between 6to4, Teredo, and IP-HTTPS. For NAT deployments, only IP-HTTPS is supported. The NRPT still functions the same way in either configuration. Hi , we solve it disabling the the teredo, 6to4 interface in the external client, but in the lab we used ip-https passing through a router not a firewall to make it simple. all Windows 7 and 8 are working normally but when we try to resolve app1.mycompany.com (published only internal it doesn’t work. How can I set it up at NRPT to solve it? What happens if we have enabled force tunneling with NRTP exceptions? How ill the client try to access the site which are their in NRTP exceptions? Force tunneling configures the NRTP to forward name resolution requests for ALL namespaces (not just the corporate namespace) to the DirectAccess DNS64 service. In this configuration there are no NRPT exemptions. That’s unusual. Can you connect with me via email and we can discuss in more detail? Are you able to ping the DN64 address? Yes able to ping the dns64 address. Do you have IPsec tunnels as well? Get-NetIpsecMainModeSA will tell you. I have a similar problem; no DNS resolution. Can ping the DNS64 address but nslookup does not work. No IPsec tunnels showing after running Get-NetIpsecMainModeSA. Eternally grateful to anyone who can contribute to a resolution. I have the same problem like Adam. No DNS Resolution. No-IPsec tunnels. But i can ping and RDP the DNS64 adress. This is driving me crazy. Can you help me? Thanks for the excellent blog post. I’m in the same situation as these guys – ping DNS64 address but no name resolution. Name resolution works locally on the DA server. Single IP, NATed IP/HTTPS only set up. If you can ping the DNS64 address and the DTEs, but can’t access internal resources, I would suspect that you also don’t have any IPsec tunnels either. If that’s the case, investigate why IPsec is failing (missing or incorrect certificates, computer account missing or disabled, etc.). One of the issues we are facing in our DA environment is the ability for our help desk technicians to use microsft SCCM to remote a machine that’s is corrected to DA. I have been doing all kinds of research and still can not get this feature to work correctly. Currently I am going do the path of isatap and DNS. Your management servers and/or workstations must have an IPv6 address for outbound management. This can be a native IPv6 address (preferred) or an ISATAP IPv6 (optional). If you search for “ISATAP” on this site you’ll find a few articles I’ve written about it. 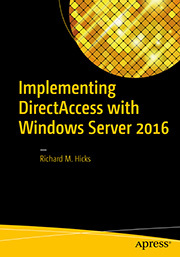 The first I’d suggest reading is https://directaccess.richardhicks.com/2013/06/24/isatap-recommendations-for-directaccess-deployments/. If you have enabled load balancing or multisite, additional configuration is required that isn’t yet documented. Drop me a note if that’s the case and I’ll explain in more detail. Great Article. We got a problem to access a website of company, that is hosted outside of organization. Configured http://www.company.com for exception and it works successfully. Regards. could you please share the process how did you acheive that, we have a same problem. take a look a second image. If my memory is goord, i told that. That’s a good read for our up coming deployment, this is for a server 2012r2 to win 7 clients, I think the fault lies with the application (trend office scan server). Looks like we need to deploy some edge servers for our DA clients. Hi Richard, should you be able to resolve the Domains NetBIOS name using nslookup/resolve-dnsname? We are having issues with long delays before being able to resolve internal server addresses after connecting. Just thought I should leave a comment as we were having DNS issues and could not find a solution. For us, performing a get-daconnectionstatus returned NameResolutionFailure no matter what we did. All components on the Remote Access Dashboard had green ticks. All client side diagnostics were positive aside from ‘netsh advfirewall monitor show mmsa’ returning ‘No SAs match specified criteria’. All certificates were working and being validated. The firewall and all Group Policies were applied correctly on the client devices. However, the clients were always in a state of connecting. The solution in our case was Group Policy on the DA server. An upstream policy had disabled the Windows Firewall causing the connection failures. Once the offending policy was blocked and the server firewall was functioning the clients connected without issue. So, check the Windows Firewall status on your server. It would be good if the Remote Access Dashboard checked this in the Operations Status page. Hi Eddie. Thanks for sharing your experience. As you learned, the Windows firewall is crucial for the operation of DirectAccess. 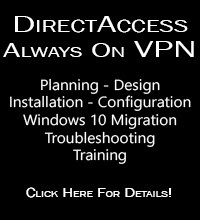 It must be enabled on the DirectAccess client and the server as well. It is a shame that the Remote Access Management console doesn’t check its operation and report on it though! It’s a serious oversight on the part of the DirectAccess developers, that’s for sure! Wow, that is very strange. I’ve never encountered a scenario like that. Have you enabled IPsec auditing to see if that yields any clues? I have – most of the events that were generated while I was troubleshooting said that negotiation timed out. Because of that, I went down the certificate path. Since then, I haven’t seen anymore logs in Event Viewer related to IPsec. I will keep an eye on it as I continue troubleshooting. I am considering migrating our CA from 2012 to 2016. I am also making sure that these clients (Windows 10 Edu Creators Edition) are fully patched. I will also see what updates are available for our DA server and apply them if they make sense (it is running on Server 2016). If you plan to upgrade your PKI, be advised that it is disruptive to clients outside of the network when you make the change. You’ll have to bring them back inside or connect via VPN to update group policy after you make the change in the Remote Access Management console. 4. 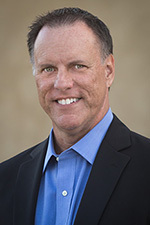 The connection is established (the above tests passed) – DCA shows Connected. 5. About 5-30 seconds later, the DCA status changes from ‘connected’ to ‘connecting’ – it says it is attempting to contact the DirectAccess server. Oddly enough, there are still IPsec tunnels established. The IPHTTPS connection shows as active too. 6. The corporate network is unreachable. The DNS server is unreachable. It ended up being software on the client machines, not a server issue, causing the problem. We are running Lenovo recommended updates on our laptops anytime they are at our Help Desk. ‘Intel Online Connect’ is included in that list of recommendations. Basically, any computer our Help Desk sees will have Windows updates and system updates installed. So, a good number of laptops in our environment were getting ‘Intel Online Connect’. Removing it and restarting has resolved the connection issue. Luckily, all of our teachers and students return to campus every day so removing it via SCCM won’t be an issue. It looks like Lenovo and Intel worked closely with each other to get this software to all devices with 7th and 8th gen chips (https://www.digitaltrends.com/computing/lenovo-now-supports-intel-online-connect/). We just updated all of our hardware so that is why it was recommended to us. It isn’t inherently bad software, it just breaks DirectAccess. I suspect it has to do with DirectAccess’ encryption. Somehow the software is interfering with it. There are reports of this issue on Lenovo’s and Intel’s forums when the product was still called ‘Intel Technology Access Driver’… At least I am assuming that is what it was called in the past. Maybe this is coincidental and ‘Intel Online Connect’ is a completely new product. Thanks for your help! I hope this information helps someone in the future. We have reached out to Microsoft and Lenovo to report the problem. Thanks so much for sharing this! I’m sure it will help others who may be experiencing the same problem. It’s a good troubleshooting less though, and one I learned a long time ago. Whenever I encounter unusual behavior like this, I always insist on testing with a clean machine or, at a minimum, removing all unnecessary GPOs and any installed third-party software. Not just disabling it, but removing it. As you learned here, and based on my extensive experience, often the culprit is third-party software interfering with DirectAccess operation in some way! Hello, I’ve got a strange issue where DA clients connecting to the internal LAN are delayed in detecting the domain profile. So, for the 1st few minutes all network resources fails. It seems as thought when the connection first initiates, it tries to connect to the /insideoutside website on the DA server, but the Windows Firewall on the client is blocking DNS resolution of the FQDN to the NLS website. I guess it tries on IPV6 a few times, times out, then succeeds on IPV4. After successful domain detection, which could take several minutes, everything works fine on IPV6. We have native IPV6. An 11 month support case with Microsoft was closed because they could not find the problem. -Thanks for any help. Wow, that sounds really unusual. I would have to suspect it has something to do with the NLS, but without digging in myself I would just be guessing. If you’d like me to look in to this for you, drop me a email and I’ll have you send me some details from your environment. What email address do I contact you at? 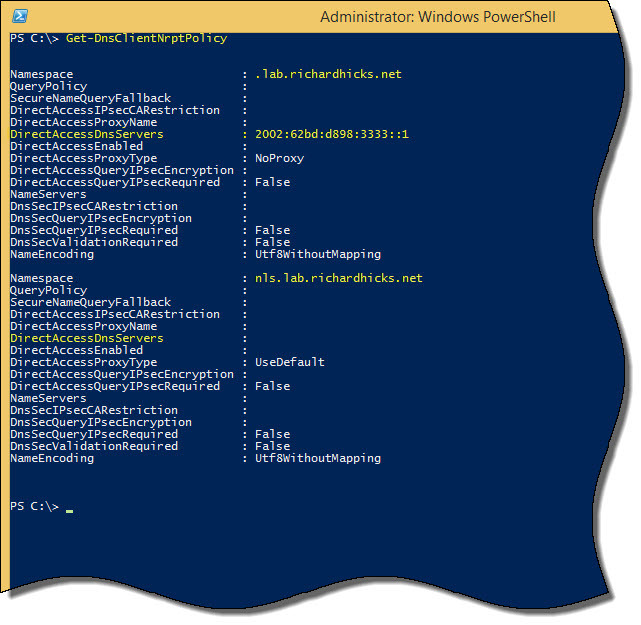 Top 5 DirectAccess Troubleshooting PowerShell Commands | Richard M. Hicks Consulting, Inc.